MAIN POINT: Let Honesty be the Best Shopping Policy. Let our shopping behaviour demonstrate that people are more important than material things. The mathematics of society is likened to any business nowadays. Get more ‘bang’ with less buck. Do more with less. Maximize profits while minimizing costs. Over the past year, I have seen more ‘dollar’ shops sprouting all over the neighbourhood. For a dollar or two, one can buy nearly any household item. From electrical extensions to canned food; from cheap note pads to colourful Christmas decorations, the dollar shop is the modern version of the poor man’s supermarket. Not to be outdone, department stores are parading their own set of marketing ingenuity. They promote hefty discounts. They offer free stuff to accompany every purchase. Some even stay open for 24hours during this festive season for the convenience of customers. Christmas time resembles the marathon of shopping. What about the Christian shopper? Do we buy something because it is on offer, or do we buy only what we need? Can we learn to be gracious in our buying? Can we place people more important than material things? In this week’s Sabbath Walk, I want to share some thoughts on shopping from a Christian perspective. The passage from Leviticus commands us to be honest in all we do. Whether we buy or sell, whatever we measure and treasure, it needs to reflect a heart of honesty. Four times in Lev 19:36, the word ‘honest’ (translated from the Hebrew ‘tsediq’) is mentioned. It can also be translated ‘just’ or ‘true.’ In other words, the people of Israel must live differently from the rest of the people of the land. A chosen people of God must be honest in all their interactions and transactions. The strength of this commandment gives us a hint about the godlessness that exists in the Canaanite society at that time. The Canaanites have many different gods, all with varying standards. Dishonest dealings are a way of life among them. Thus, cheating and unjust measurements can easily spill into the lives of the impressionable children of Israel. How a person behaves largely depends on the kind of god they worship. Israel worships the LORD GOD (Lev 19:2), that because God is holy, Israel must be holy. Honesty is in obedience to a holy God. Your restaurant bill is $33. You give $50 in cash. The waitress mistakenly returns you $20. Do you take the money and leave quietly? Patrick buys 5 shirts. When he gets home, he finds an extra shirt in the bag that he did not pay for. Jinny is on a holiday. At a small shop in a poor village, she is attracted to a straw hat on sale for $5. Back home, she knows that it is at least 8 times more expensive. After much intense bargaining, she leaves the shop with three straw hats for $5. Jinny smiles while the shoplady sobs quietly. Will you patronize a store that pays unfair wages to their employees? What will an honest person do? Will we simply blame it on the waitress for her carelessness in giving the wrong change back? Will Patrick start rationalizing that it is so inconvenient to return the extra shirt back to the store? Will Jinny begin to reason that it is all a business transaction agreed by all parties? After all, isn’t it true that the poor shoplady can choose not to sell in the first place? Lev 19:36 calls for ‘honest scales and honest weights.’ This applies both ways, from the seller as well as the buyer’s perspectives. 3) Don’t Just Buy Cheap. Buy Fair. Pricing is a critical part in the retail business. A man enters a shop to inquire about one SLR camera. The shop assistant earnestly answers all of his technical queries. From the detailed technical specifications to the aesthetic look-and-feel, the man takes nearly an hour just asking questions. The shop assistant patiently waits on him, even turning away potential customers as a result. After an hour, the man walks off, claiming that the price is ‘over his budget.’ This man then walks into another shop, and pays for the exact same camera for a few dollars less, and all in a matter of 5 minutes. This may look all legal, but is ethically suspect. Sometimes I feel for those retailers struggling to make an honest living. In some cases, they seem to be held at ransom by unreasonable customers, who think that their money grant them the power to lord over retailers. I like to suggest that we adopt an attitude of ‘buying fair’ rather than ‘buying cheap.’ If our objective in shopping puts ‘cheap’ as primary, ‘honesty’ can become a distant secondary concern. If honesty guides our life, we will deal fairly with all people, even though it may cost us more. Our honesty reflects the god we worship. Lev 19:36 ends with a dramatic reminder that ‘I am the LORD your God, who brought you out of Egypt.’ It reminds Israel that what they have is largely given to them, not earned. Their salvation is freely granted, not transacted. When God tells them to be holy, it is because God wants them to be an example to the nations, and a testimony to all in the foreign land. It is the Old Testament version of witnessing to the ancient world. In our modern world, we need to maintain our witness for God. In many secular societies, it is getting increasingly difficult to share and speak the gospel literally. Nevertheless, the gospel when it is lived out cannot be muffled. Who will reject a kind deed? Who will not acknowledge honest dealings? Can Christian shoppers be exemplified by honest dealings, in both buying and selling? Yes we can. Christians should not be too quick to do what the world around us are doing. Think about other ways in which you can celebrate the festive season. 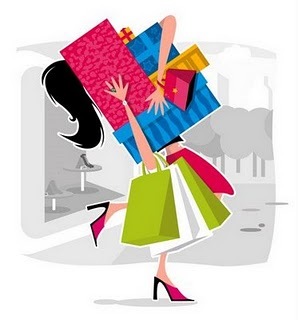 Is there a compelling reason to shop and buy for the sake of shopping and buying? In rich consumerist societies, many households buy more than what they need. Let me suggest three shopping tips for Christians. Firstly, make shopping a priority for giving. What about buying a useful stuff for a needy person? This year, I refrain from indulging myself in a hundred dollar computer accessory. That $100 will go to a needy student’s fund. Be generous and gracious in our buying, knowing that each time customers squeeze the price, the rest of the purchasing chain (storeman, salesperson, cashier, factory worker) gets squeezed eventually. When tipping, do it willingly and graciously with a thankful heart to God. Even if others try to cheat us, we will refrain from 'cheating back' at them. Secondly, consider a shopping moratorium so that we can be more attentive to people. What about a shopping fast? When others are busy buying and accumulating stuff, resist. Do something else. Use it as a spiritual exercise to be thankful and be content with what we have. For some of us who rely on shopping therapy to de-stress, perhaps this is a good time to learn to lean on God, and to appreciate people for who they are, and not what they can give. Resist the temptation of filling the Christmas with shopping and more shopping. GK Chesterton gives this particularly apt insight. Finally, if you really need to shop, shop honestly. Do business with honest retailers. Don't let price be the sole determining factor. Do not buy things merely because it is cheap. Neither should we continue to accumulate things that we do not need. This is one reason why I do not like gift-exchange programs. It seems to me that it is a merry-go-round of people giving one another things they will likely NOT need. Why not just go around sharing food over a potluck meal? If we want to buy gifts, be wise with our buying, to make sure that it meets a particular need. Will your shopping reflect the Christ in you? May your Christmas season be holy unto the Lord. May honesty fill all of our Christmas occasion with glad tidings and joy, giving of goodwill and the gifts of hope, joy and peace.